I absolutely love the look of his light. Much larger than I expected. Crystal Ribbon Chandelier Chandeliers Modern / Contemporary Lighting 20" Wide - Good for Dining Room, Foyer, Entryway, Family Room and More! 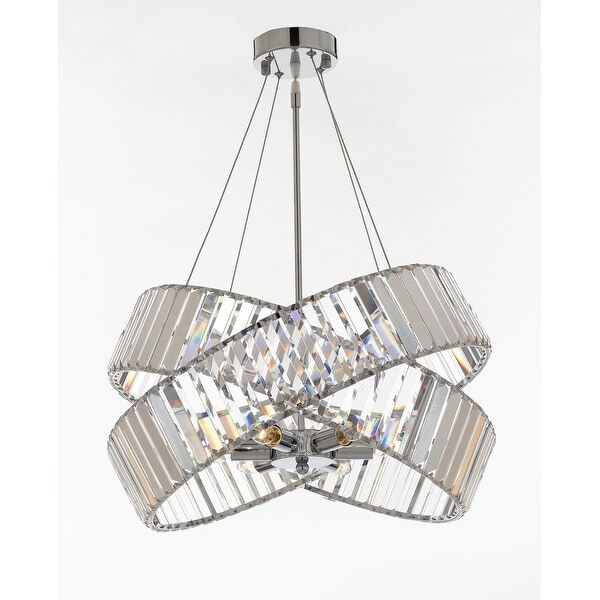 This beautiful lighting fixture features 100% Crystals which capture and reflect the light from its 6 light bulbs. Truly a stunning chandelier, this fixture is sure to lend a special atmosphere anywhere it is placed. SIZE: W 20" H 10" Comes with an Adjustable Cable 6 lights. Requires (6) 40 watt candelabra base bulbs (E12) - not included. Assembly Required. Please note, when you purchase an item from the Gallery you can be assured of the "Gallery 4 Points of Confidence": 1. Each item comes with a Certificate of Authenticity, certifying this product is an authentic Gallery lighting fixture. 2. Each item comes with a Gallery backed warranty (Established 1978). 3. Each item will include Gallery verified and approved diagram and instructions. 4. Each purchase is provided with a toll free number for free Gallery tech support. "The listed height of 10” does not seem accurate. Can you please verify what the minimum overall height from canopy to the bottom of fixture would be. " "Is there a way to mount this on a slanted ceiling?"